1.Oh, Lady Be Good03:58 (Ira Gershwin - George Gershwin) Ella Fitzgerald. assets/extraits/369692/FR14F1001010.mp3 2.Do, Do, Do02:28 (Ira Gershwin - George Gershwin) Doris Day. assets/extraits/369692/FR14F5100690.mp3 3.S Wonderful02:46 (Ira Gershwin - George Gershwin) Gene Kelly / Georges Guetary. 4.Fascinating Rhythm02:53 (Ira Gershwin - George Gershwin) Tommy Dorsey Orchestra. 5.Love Is Here To Stay02:36 (Ira Gershwin - George Gershwin) Frank Sinatra. assets/extraits/369692/FR14F4900650.mp3 6.Summertime02:44 (Ira Gershwin»DuBose Heyward - George Gershwin) Charlie Parker. 7.I Loves You Porgy02:55 (Ira Gershwin»DuBose Heyward - George Gershwin) Billie Holiday. 8.But Not For Me02:46 (Ira Gershwin - George Gershwin) Jackie Gleason. 9.I've Got A Crush On You03:21 (Ira Gershwin - George Gershwin) Lee Wiley. assets/extraits/369692/FR14F4600740.mp3 10.Embraceable You03:05 (Ira Gershwin - George Gershwin) Django Reinhardt. 11.Nice Work If You Can Get It02:34 (Ira Gershwin - George Gershwin) Sarah Vaughan. 12.I Got Rhythm04:06 (Ira Gershwin - George Gershwin) Lester Young. assets/extraits/369692/FR14F1001050.mp3 13.Clap Yo' Hands02:35 (Ira Gershwin - George Gershwin) Whispering' Jack Smith. 14.The Man I Love02:36 (Ira Gershwin - George Gershwin) Erroll Garner. 15.Someone To Watch Over Me03:11 (Ira Gershwin - George Gershwin) Ella Fitzgerald. 16.I'll Build A Stairway To Paradise02:22 (Ira Gershwin»B.G. De Sylva - George Gershwin) Georges Guetary. assets/extraits/369692/FR14F4900460.mp3 17.Somebody Loves Me02:42 (Ballard McDonald»B.G. De Sylva - George Gershwin) Art Tatum. 18.Shall We Dance02:17 (Ira Gershwin - George Gershwin) Fred Astaire. 1.Summertime04:55 (Ira Gershwin»DuBose Heyward - George Gershwin) Ella Fitzgerald / Louis Armstrong. 2.Let's Call The Whole Thing Off03:07 (Ira Gershwin - George Gershwin) Fred Astaire. 3.They Can't Take That Away From Me03:15 (Ira Gershwin - George Gershwin) Charlie Parker. assets/extraits/369692/FR14F1001120.mp3 4.Somebody Loves Me03:25 (Ballard McDonald»B.G. De Sylva - George Gershwin) Peggy Lee. 5.Someone To Watch Over Me02:46 (Ira Gershwin - George Gershwin) Art Tatum. assets/extraits/369692/FR14F4500550.mp3 6.Swanee01:53 (Irving Caesar - George Gershwin) Al Jolson. 7.But Not For Me03:11 (Ira Gershwin - George Gershwin) Ella Fitzgerald. assets/extraits/369692/FR14F5500200.mp3 8.Love Is Here To Stay03:20 (Ira Gershwin - George Gershwin) Stan Getz. 9.The Man I Love03:07 (Ira Gershwin - George Gershwin) Billie Holiday. 10.A Foggy Day02:46 (Ira Gershwin - George Gershwin) Fred Astaire. assets/extraits/369692/FR14F5600640.mp3 11.They Can't Take That Away From Me04:36 (Ira Gershwin - George Gershwin) Ella Fitzgerald / Louis Armstrong. 12.Nice Work If You Can Get It02:43 (Ira Gershwin - George Gershwin) Art Tatum. 13.Embraceable You02:56 (Ira Gershwin - George Gershwin) Dinah Washington. 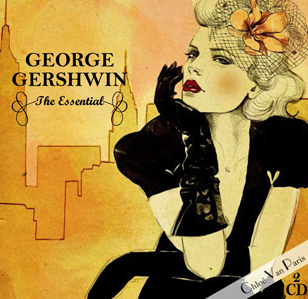 14.Liza02:46 (Ira Gershwin»Gus Kahn - George Gershwin) Leo Reisman And His Orchestra. assets/extraits/369692/FR14F1001140.mp3 15.I've Got A Crush On You02:45 (Ira Gershwin - George Gershwin) Gene Kelly. 16.How Long Has This Been Going On ?03:11 (Ira Gershwin - George Gershwin) Ella Fitzgerald. assets/extraits/369692/FR14F1001150.mp3 17.So Am I04:12 (Ira Gershwin - George Gershwin) George Gershwin. 18.S Wonderful02:35 (Ira Gershwin - George Gershwin) Joe Williams And The Count Basie Orchestra. assets/extraits/369692/FR14F1001090.mp3 19.Love Walked In02:30 (Ira Gershwin - George Gershwin) Louis Armstrong. 19.Bess, You Is My Woman Now05:30 (Ira Gershwin»DuBose Heyward - George Gershwin) Ella Fitzgerald / Louis Armstrong.